Diamond Select Toys and Art Asylum have released some new images of their upcoming San Diego Comic-Con 2012 Exclusive Avengers vs X-Men Minimates. If you’re still on the fence about Diamond Select’s Avengers vs. X-Men Minimates Box Set, exclusively available at San Diego Comic-Con 2012, we’ve got some new photos that may make up your mind! The set includes a removable Juggernaut helmet for Colossus, a removable cape for Emma Frost, a removable jetpack and weapons for Hope Summers and an interchangeable hairpiece for Cyclops, as well as his first-ever beam-firing mask! The set will be $18 at Booth 2607, but look for it at other retailers around the show floor, as well! Check out the gallery of images here! To see all of DST’s Comic-Con exclusives, click here! 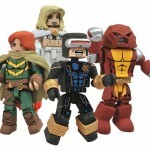 Then go vote on the line-up for the second AvX Minimates box set at Toysrus.com!